Ophthalmic Devices Market size was valued over USD 41.5 billion in 2017 and is expected to witness more than 3.7% CAGR from 2018 to 2024. Diminishing visual functions with increasing age is a growing concern in the elderly population in Middle East & Africa and Asia Pacific region. An aging population is comparatively more susceptible than the younger population to many ophthalmology related health concerns. Increase in number of elderly populations will result in large patient population base with ophthalmic disorders requiring more ophthalmic surgeries thereby, fuelling the demand and growth of ophthalmic devices market. The number of people suffering from several different types of ophthalmic disorders in Latin America region is increasing since last few years. According to the population-based survey, (Rapid Assessment of Cataract Surgical Services [RACSS] and Rapid Assessment of Avoidable Blindness [RAAB]), approximately 60% of blindness in the region is due to cataract. Increase in number of people suffering from ophthalmic disorders and high need for treatment will augment the industry growth in the near future. Every other type of ophthalmic surgical procedures poses one or the other type of risks. Several number of post operational risks associated with eye surgeries such as over- or under-correction of vision, visual aberrations, development of chronic dry and red eyes, infection, corneal estasia etc. Hence risk associated with ophthalmic surgeries will impede the growth of ophthalmic devices market. Ophthalmic diagnostic and monitoring devices market is estimated to witness robust growth at a CAGR of 3.9% during the forecast timeframe. The number of ophthalmic disorders is on rise since the past few years and is projected to grow at a faster rate in near future. As per the statistics published by National Eye Institute, currently around 1.3 million Americans are blind and 2.9 million have low vision; and an estimated 2.2 million Americans will be blind and 5 million will have low vision by 2030. Hence, increase in eye disorders will lead to growing demand and adoption rate of diagnostic and monitoring devices, fuelling the ophthalmic devices industry growth. The vision care market accounted for over USD 21.5 billion in the year 2017 and is estimated to expand significantly over the projection period. According to the National Eye Institute, around 11 million Americans have common vision problems such as myopia, hyperopia, presbyopia and astigmatism that can be treated with the use of prescriptive vision care products such as glasses or contact lenses. Increase in number of people suffering from refractive and common vision problems will result in growing demand and adoption rate for vision care products, augmenting the business growth. The use of ophthalmic devices in specialty clinics is projected to rise at a CAGR of 4.1% during the forecast timeframe. The demand for ophthalmology will increase due to the changing demography across the globe towards aging population. Growing demand for eye care services due to increase in number of patients suffering from ophthalmic disorders will ultimately result in increasing number of ophthalmologists thereby, boosting the sales and demand for ophthalmic devices in the specialty clinics business segment. Majority of the ophthalmic products such as vision care products are used by the common consumers and accounted for the total revenue of over USD 19.5 billion in 2017. Visual impairment is one of the severe health concerns across all the countries. Almost around 80% of the people with ophthalmic disorders need treatment. In the last few years a clear majority of the consumers that need ophthalmic treatment has increased the demand and adoption for vision care products. U.S. ophthalmic devices market valued at USD 13.8 billion in 2017 and is forecast to grow with a CAGR of over 3% during the projection timeframe. According to the American Academy of Ophthalmology, more than 40 million people in the United States suffer from several eye disorders such as cataract, glaucoma, age-related macular degeneration (AMD), diabetic retinopathy and dry eye. And, around 8 million people suffer from visual impairment and more than 150 million people use corrective eyewear for the treatment of refractive error. Growing number of ophthalmic patients and surgeries will boost of U.S. ophthalmic devices industry growth. India ophthalmic devices market is estimated to expand at a CAGR of 4.6% during the forecast timeframe. In the developing nations such as India, one of the major healthcare concerns affecting the health of the people is the growing burden of preventable blindness. According to the World Health Organization (WHO), around 8 million blind and over 54 million people are visually impaired in India. 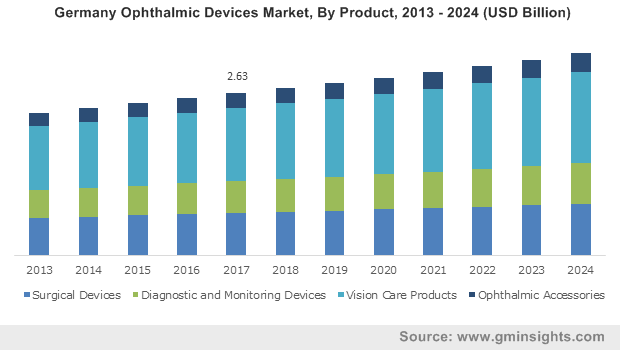 Growing eye disorders and increase in government initiatives such as Vision 2020 in the country will boost the growth of ophthalmic devices market growth in the future. 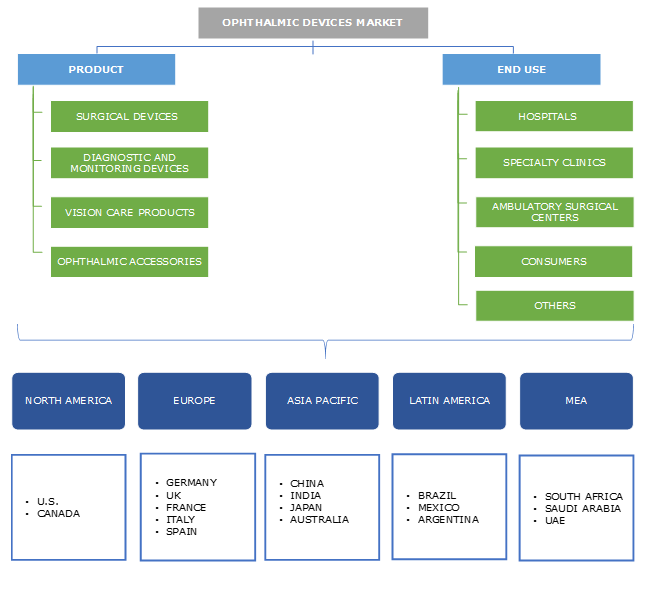 Some of the leading players in the ophthalmic devices market include Essilor International, Johnson and Johnson Vision Care, CooperVision AG, Bausch and Lomb, Hoya, Nidek, Topcon, Alcon, Carli Zeiss and Cannon. These companies mainly focus on strategic decisions to increase the research and development investment. Merger and acquisitions have increased the capabilities of the companies and increase their efficiency to sustain in the market by providing better solutions. Also, new product launches in developed geographical regions will enhance the growth of the companies. For instance, in January 2018, Topcon Corporation received 510(k) clearance for DRI OCT Triton Series from FDA and will start its sales in the Unites States. Ophthalmology or eye care is largely growing industry across the globe especially in the developed region of North America and Europe. The change in the demographics and lifestyle of the people will result in increase in the demand for ophthalmic devices in the forthcoming years, but the revenue generation of the market will be depending on healthcare reforms and state of regulation. Ophthalmologists, optometrist and the customers using vision care products are the main source of revenue generation in the industry. Although the ophthalmic devices market is currently fragmented, the commoditization and consolidation in healthcare will catch up eye care in the upcoming years resulting in massive business growth.